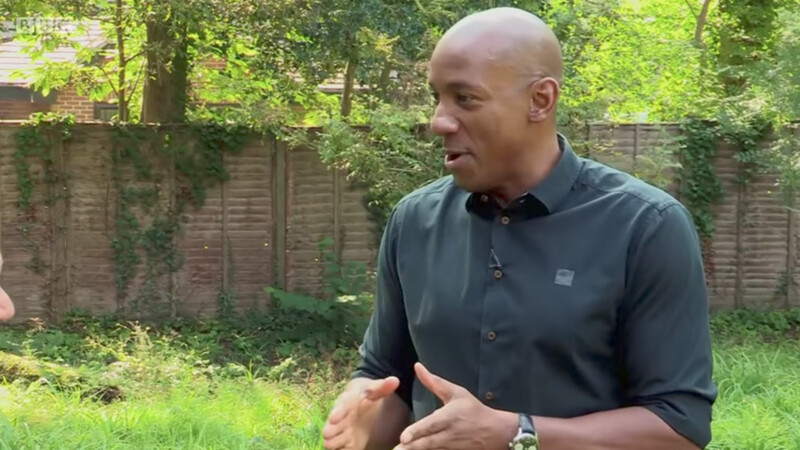 Dion Dublin on Homes Under The Hammer: How did the former Man Utd star switch to daytime TV? There are a number of different career paths open to former Premier League stars when their playing days come to an end - management, coaching and television punditry to name but three. But former England striker Dion Dublin has pursued a much more unusual new vocation since he played his final match for Norwich City in 2008. Dublin - a hugely popular figure on the pitch whose clubs included Manchester United, Aston Villa and Coventry City - is now a presenter on the BBC daytime property show Homes Under The Hammer. But how did the 48-year-old end up in his new role? HOW DID DUBLIN GET THE JOB? Dublin was announced as a new presenter on Homes Under The Hammer in March of 2015, becoming the third member of the team alongside Martin Roberts and Lucy Alexander. Alexander has since left and been replaced by Martel Maxwell. "I am thrilled to be joining Martin and Lucy on Homes Under The Hammer," Dublin said at the time. "I have a passion for property and look forward to meeting people on the show who share that passion." As is not uncommon among footballers, Dublin became involved in the buying and selling of property during his playing days. He decided to take that interest one step further with the Homes Under The Hammer job. The show sees Dublin and his co-presenters follow the stories of homes bought at auction, with buyers often completely renovating them and having to overcome many hurdles along the way. According to the Sun, Dublin landed the role after receiving training through the BBC's Diversity Creative Talent Fund, which aims to provide opportunities to potential stars from ethnic groups currently underrepresented on television. Lisa Hazlehurst, of the company behind the show, said: "Dion's enthusiasm for property is infectious and we're really excited he is joining Homes Under The Hammer, which has proved such a hit with audiences for more than a decade." WHAT HAVE VIEWERS MADE OF HIM? Sadly, not even Dion can please everyone. After his debut on the show, one unnamed fan was so unhappy with the new setup that she wrote a formal complaint to the BBC questioning Dublin's credentials and the need for a third presenter. According to the Press Association, the BBC's complaints manager decided not to uphold her grievance but she felt so strongly that she decided to appeal that decision. The appeal was rejected, too. "She was displeased that proceeding with her appeal was considered a waste of resources while the decision to employ a third presenter on Homes Under the Hammer was not," the report noted. Fortunately, that viewer appears to be in the minority, with most enjoying - or simply slightly bemused by - the sight of a former Premier League footballer talking interior design. 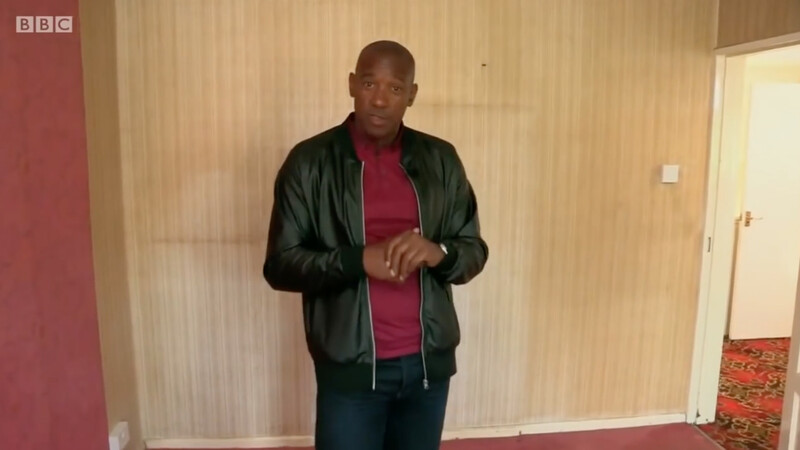 I totally find myself in a place where I no longer think it's weird that Dion Dublin hosts 'Homes Under The Hammer'. This is not the first pursuit of Dublin's that has been some way outside of the stereotypical footballer's usual territory. A couple of years before joining Homes Under The Hammer, the former Aston Villa man had launched the Dube - his very own, brand-new percussion instrument that resembles a box big enough to hold a football. Each face of the Dube has a different tone and and you can also create varying sounds by hitting it in different places, such as the middle and the rim. As Dublin explains on the instrument's official website: "Whilst at Norwich in 2006 I had that 'light bulb' moment! My passion, after football, has always been music, in fact I often say it is something that had lay dormant in me for years. "During the latter stages of my playing career I visited a hardware shop, bought some wood and nails, went home and put the 6 sides together – The Dube was born! "Whilst in its infancy, I felt I had created something I wanted to perfect. After much deliberation, consultation and hard work, I now feel I have the almost perfect (because everything can always be improved) version of The Dube." The Dube can be bought online to this day - though it'll set you back over £200. WHO DID DUBLIN PLAY FOR? Dublin sits 19th on the list of Premier League all-time top goalscorers, ahead of the likes of Didier Drogba and just behind Ian Wright and Steven Gerrard. 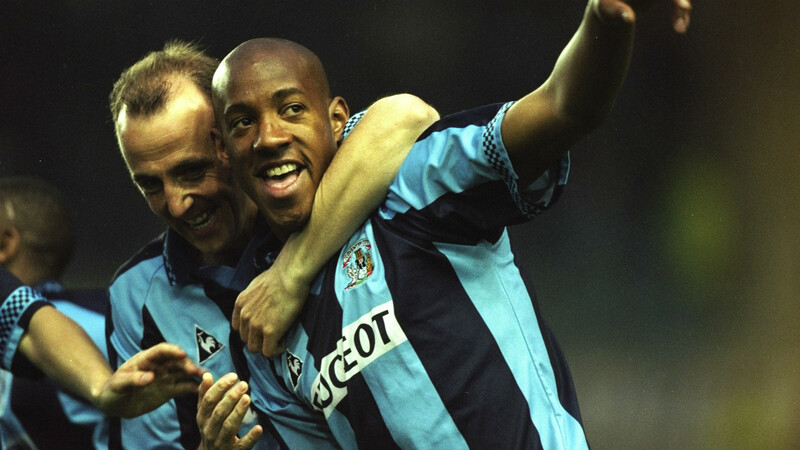 His best season came in 1997-98 with Coventry City, when he scored 18 goals in the league alone and shared the Golden Boot with Michael Owen and Chris Sutton. After coming through the system at Norwich City, Dublin made his name with Cambridge United, who converted him from a centre-back to a striker. He helped Cambridge to successive promotions from the Fourth Division to the Second Division before Sir Alex Ferguson paid £1 million to bring him to Manchester United. Less than a month after signing, though, Dublin broke his leg and by the time he returned, Eric Cantona had arrived at Old Trafford. Dublin was solid to Coventry in 1994 and many were unhappy to see him left out of the England squad for the World Cup after his superb 1997-98 campaign. Coventry cashed in, selling him to Aston Villa for £5.75m. In 1999, Dublin broke his neck and - according to his manager, John Gregory - was lucky to escape an injury that could have left him in a wheelchair, but amazingly he returned to action just three months later. Dublin went on to play for Millwall, Leicester City and Celtic before returning to Norwich, where he would retire in 2008. He won four caps for England.